Last Prog: may the day never come! …but this magnificent number doesn’t even include the 287 scripts he wrote for the rather delicious Daily Star Judge Dredd comic strip. - Or the many, many, stories he has written for publications such as Eagle, Toxic!, Scream, Battle/Action and so on. John Wagner, in disguise as John Howard, bashes out script after script. Black comedy; satire; hard men; tight plotting; well-choreographed action scenes; stories based around outrageously stupid people doing wonderfully stupid things. TV commentators as hilarious narrators. Writing entire epsiodes in somng/rhyme form - others do it, too, but Wagner seems to have a special affinity for it. He’s also celebrated for his very terse panel descriptions that many artists have found freeing, allowing them to go crazy with their depictions of, say, Judge Dredd, his bike, his gun, and the city he lives in. Oh, and he’s perhaps the undisputed master of writing long, long stories that remain exciting as individual episodes as well as being coherent and dramatic over a long chunk – a lost art in comics, I feel. Wagner writes the best class of idiots. All around, JohnWagner has been a busy man. In a large number of Progs he has written multiple stories. And the longest stretch between Wagner-penned stories is a mere 96 Progs, from the end of Button Man in Prog 791 to the start of Judge Dredd: Conspiracy of Silence in Prog 889. Of course, during that time he was hardly idle, writing monthly Dredd scripts for the Megazine, a modest comedy hit with Al’s Baby, and the absolute classic Return of the Taxidermist. 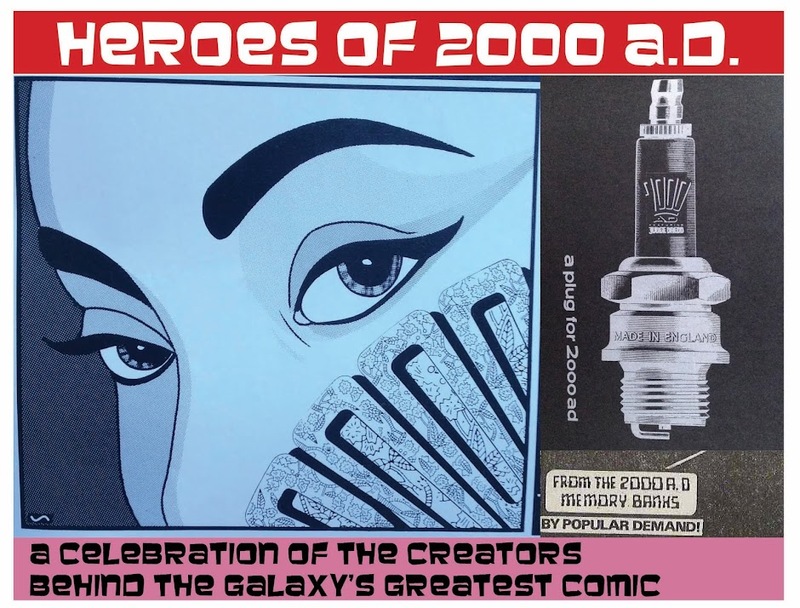 Indeed, it’s only in recent times that readers who enjoy both 2000 AD and the Megazine have had to suffer the occasional lack of Wagner for weeks or months at a stretch. Years, never. I don’t think there’s any doubt that by any set of criteria, John Wagner is the man. He will forever be celebrated for Judge Dredd, a character he was, we’re told, inspired to create by Clint Eastwood’s Dirty Harry. To my mind, his second-most beloved creation - Strontium Dog - owes a certain debt to Mr Eastwood as well, from his westerns. Indeed, it seems to me that one way into the work of Wagner is through action cinema of the 1970s. As seen in many thrillers from this decade, Wagner’s men are stoic, generally competent without being superhuman, and handy in a fight. They aren’t prone to whining like so many superheroes, they’re not over the top with quips and muscles like the 80s action stars, and while Wagner’s hard men are not averse to the idea of a romantic liaison, they don’t really care if they’re in a relationship or not. Wagner’s stories have characters and a plot, and no mucking about with being pretentious. But that’s not to say there’s no substance! Again, as found in 70s cinema (both the high-end productions and the delights of genre and exploitation films), lurking inside most Wagner scripts there’s a layer of social commentary that you can ignore if you want, but it’s there for you to enjoy as well. A very tricky thing that, to fit commentary in without making it preachy, or, even worse, so obvious as to become text rather than subtext. And who needs subtext when you can have straight up satirical text? This piece from 1979 predicts today's current state of talent-show telly, which has of course been around for aaaages. But he isn’t just a man of action. Wagner is one of the only 2000 AD writers to score hit after hit with his comedies. 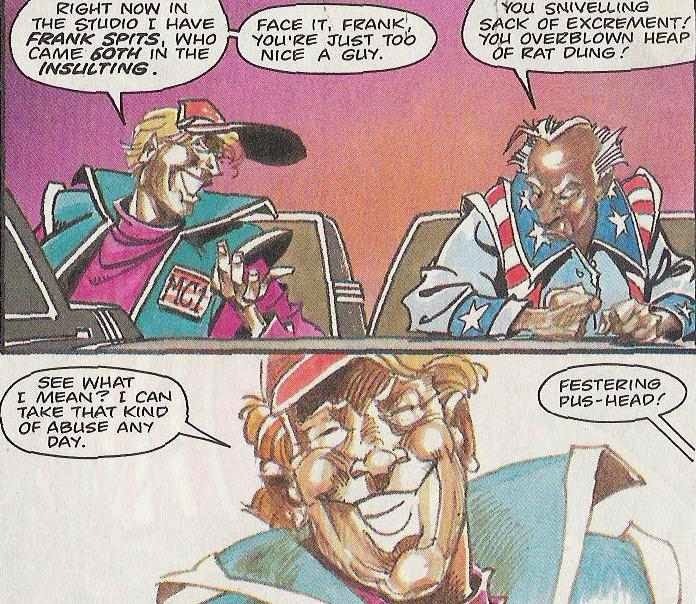 2000 AD is full of humour, but Tharg only occasionally commissions explicitly funny strips. This is probably because they’re often miserably bad, as seen in, say, Captain Klep or the Space Girls. But Wagner pulled out RoboHunter, Ace Trucking Co**, Young Death and Al’s Baby, just to name the most overtly funny ones. 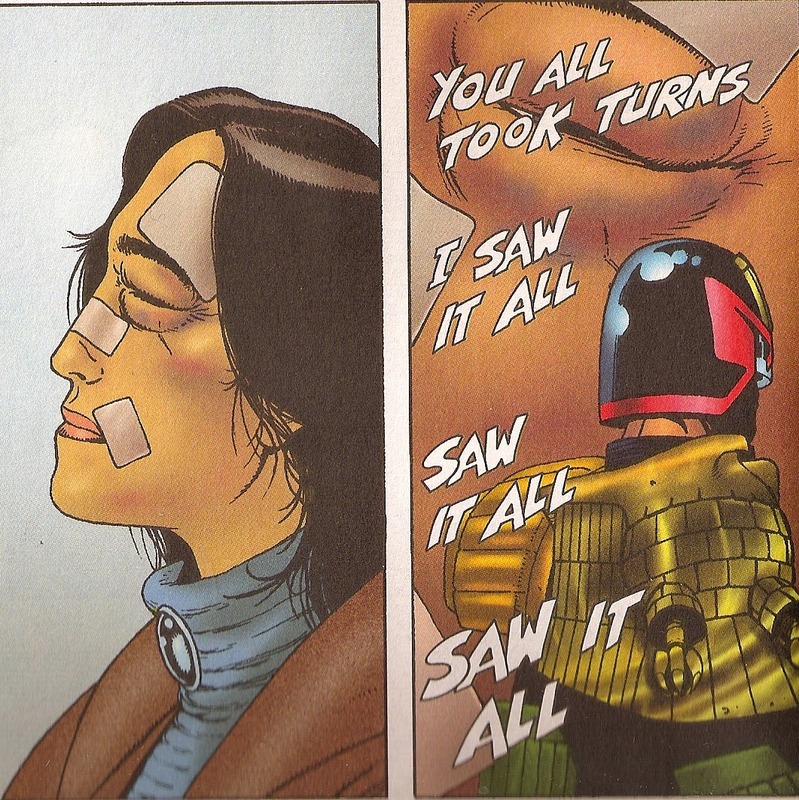 Let’s not forget, in both the foreground and background of many Dredd tales there’s a thick seam of sarcasm, send-up, slapstick and delightfully pithy one-liners. Of course, Wagner also suffered the fate of being too clever for his own good with Teen Tax Consultant - a lovely comedic idea with nowhere to go plotwise; and the Balls Brothers – a superhero satire so scathing that it left no room for readers to get behind the characters***. Teen tax consultant has its moments, for sure. It’s not all laughs. While it’s ludicrous to compare comedy strips to straight strips and argue about which is ‘better’, some would say that Wagner’s very best 2000 AD output is his serious drama, for example Portrait of a Mutant, America, the Button Man series and Song of the Surfer**** Of course, in every one of these tales Wagner cannot resist dropping in generous dollops of wry humour amongst the pathos. Ms Beeny remembers an assault. It’s important to note that Wagner the writer is much loved for his collaborations, especially with one Alan Grant (who will feature in the count-up really rather soon! 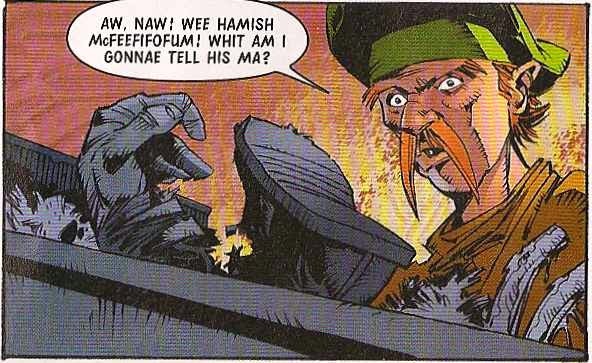 ), but also, in his pre-2000AD days, with Pat Mills. Could anyone imagine a more delicious trio of candid conversation, fertile imaginations and work ethic in a room together? I don’t know about you, but I find it near impossible to tell the difference between a Wagner solo script and a Wagner collaboration. A sure sign that the collaboration is working well, especially given how outspoken both Mills and Grant come across in interviews! I suppose that Shako! 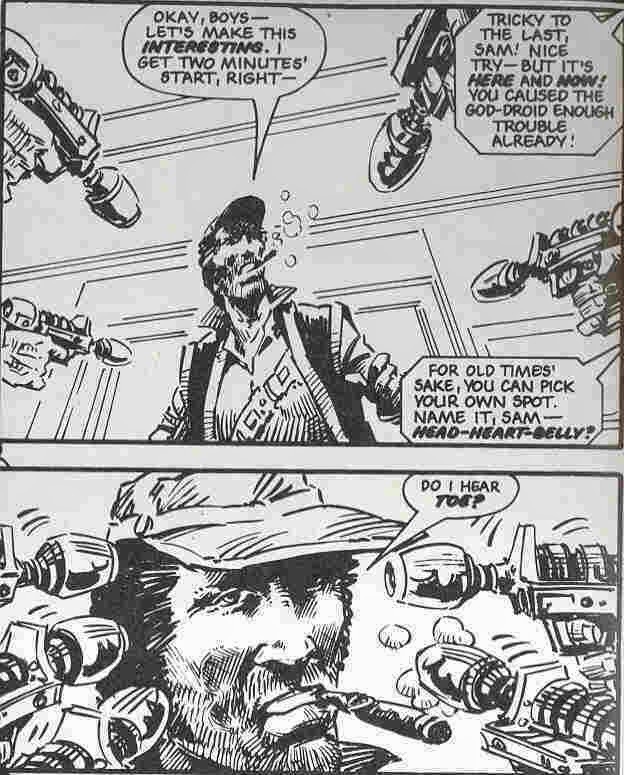 (the only Wagner/Mills collaboration for the House of Tharg) displays a certain crazed over-the-top quality that smacks of Mills’s involvement, while many classic-era Dredds and Strontium Dogs are laced with that bit of extra humour which I associate, perhaps wrongly, with Grant. The point is, Wagner works as well in company as he does flying solo. Likely this means he’s a decent chap, which isn’t relevant, but never hurts when appreciating an artist’s work. John Wagner, we salute you. **OK, I understand that a vocal minority doesn’t find Ace Trucking to be that funny. But lots of people must have done, because the creators tried to kill the series twice and still brought it back owing to reader demand! I loved it then and love it still. ***Well, I didn’t much like it anyway, but that may well be because I actually like superhero comics? Kev Walker’s art was great, mind. What a fantastic idea for a Blog. Well done sir and long may it continue! There is, technically, a finite number of entries that can follow the theme, but it'll take a good 2 years, minimum, to get there! Arh but then you have to go back an up date all the info. It'll never end! Smashing blog sir! Hats off to you! Thanks Sheridan, should be fixed now!